Looking to transform your nail polish collection, then look no further with Essie's Luxeffects collection. Initially released for the 2011 holiday season, we're now being graced with these dynamic top coats on the other side of the Pacific. It truly was a pleasant surprise to see these in French Pink, as they are somewhat of an urban legend in the US due to the shelves being raided by polish fiends and nail enthusiasts. 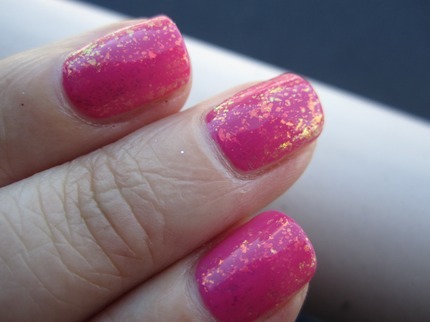 I first came across one variation of the flakie polish here, but never gave it a proper go as I get my nails done on a weekly basis. Now I don't have any excuses to not wear it. 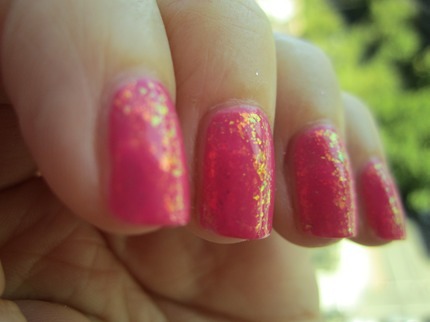 Heavy on dimension, depth, and personality - flakie top coats really add that extra sparkle to one's overall appearance. The opalescent shine lends itself to a myriad of colours; by pairing it with anything from the rainbow, it can truly give you endless options and be transformative as it wears you. 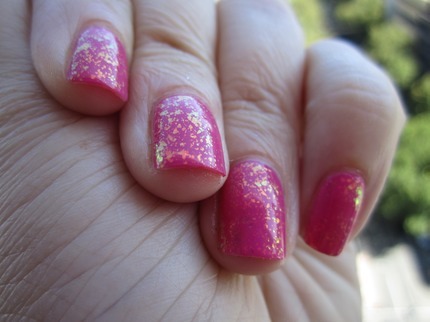 For my base colour I went with Essie's Funny Face, a punchy pink that smacks of raspberry. 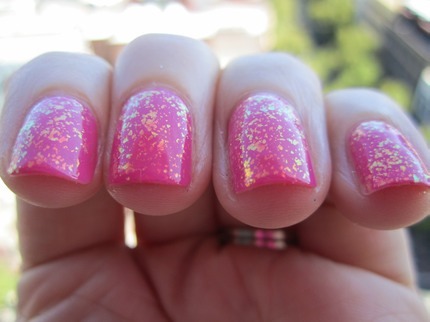 Depending on how the light hits your nails, you can catch specks of gold, green, yellow, orange, blue and pink. Application was a cinch; Janice applied one coat of Funny Face and then followed it up with Shine of the Times. Wear time was optimal - I didn't notice any chipping or peeling except on the usual right pointer finger (darn zipper). This week I switched things up a bit more and played with Set in Stone and Pure Pearlfection. Make sure to check back next week! Happy St. Patrick's Day and have a shamrock shake for me.